The constellation Orion the Hunter is probably the easiest to pick out of all the constellations in the winter sky. It is identifiable by Orion’s Belt, three medium-bright stars in a short, straight row at the mid-section of the Hunter. See these stars? They are easy to spot on the sky’s dome. As seen from mid-northern latitudes, you will find Orion in the southeast at nightfall and shining high in the south around 9:30 p.m. tonight. (If you live at temperate latitudes to the south of the equator, you will see Orion high in your northern sky at this hour.) Pick out Orion’s Belt and the nearby bright stars in that part of the sky, and you have probably found Orion. Stars in distinct constellations like Orion look connected, perhaps even gravitationally bound, but usually they aren’t. Certainly Orion’s stars aren’t bound to each other by anything but their general location near one another along a single line of sight from Earth. The stars of Orion just happen to make an easy visual pattern on our sky’s dome. The stars in Orion and most other constellations are generally located at vastly different distances from each other. 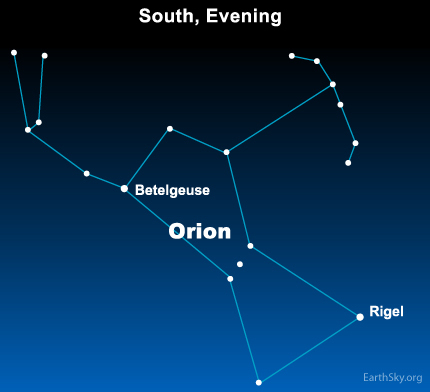 For example, the two brightest stars in Orion are Betelgeuse and Rigel. Betelgeuse is estimated to be located 522 light-years away, while Rigel’s distance is 773 light-years. Those prominent stars in Orion’s Belt, however, are somewhat related. They are all giant stars in a nearby spiral arm of our Milky Way galaxy. These stars’ names are Mintaka, Alnilam, and Alnitak. At this time of year, Orion takes center stage in the star-studded sky! Can I see our galaxy from Earth?